Ecosse è una azienda scozzese che realizza cavi da 25 anni e, grazie ad un focus attento e serio sulla ricerca e sviluppo, ha per prima introdotto sul mercato alcune notevoli unicità che la rendono un produttore acclamato e ben conosciuto. Già dal 1997 Ecosse propone e utilizza metalli particolarmente puri (7N) e con conformazioni uniche (rame e argento monocristallino grain free Monocrystal™) per poi arrivare al super-monocristallino (Super Monocrystal™) verso la metà degli anni 2000. Per una vasta panoramica della tecnologia e dei materiali utilizzati per la realizzazione di questi capolavori seguite questo link Tecnologia. I propri cavi vantano innumerevoli riscontri positivi di pubblico e critica (seguite il link Awards per scoprire le diverse decine di premi e riconoscimenti assegnati dalle riviste di settore) nonché un rapporto qualità prezzo davvero inarrivabile nel panorama highend odierno. Tutti i prodotti sono realizzati a mano in Scozia da professionisti con decine di anni di esperianza nella terminazione dei cavi. Ecosse is a specialist company engaged in the design and manufacture of low voltage signal analogue and digital interconnects, loudspeaker cables and mains A.C. Powerchords. The commitment of its principals, everyone committed music and hi-fi /audio-visual enthusiasts, is to provide the highest quality products at prices which reflect today's value for money zeitgeist. Close working alliances, extensive research and testing (and re-testing), ever- evolving product design, effort and the love of music culminated in the introduction - in 1996 - of Ecosse' first success in the field-our sonically vastly superior, patented Monocrystal™ copper and silver conductor products. Since '96 our Monocrystal™ loudSpeaker and interconnect designs have swept the boards at countless award ceremonies and comparative magazine evaluation tests-and this is no idle boast, you just need to examine this website for confirmation. Our Monocrystal™ success heralded the introduction, a year later, of our ambitious ultra-high quality, (and now) multi-award winning low-cost Oxygen Free Copper products. Frankly, the unbelievable success of these cables, across the board, has confounded our cumbersome, highly expensive competitors - and surprised even us at times! Next we proudly introduced Super Monocrystal (SMS) - our pioneering commitment to the advancement of vastly-superior conductor technology. First in this exclusive range is the 2.4 loudSpeaker cable. But reviews and awards aren't everything. It's the hundreds of testimonials we get every year from satisfied and enthusiastic customers and dealers alike that drive us on, that motivates our close-knit hugely knowledgeable team of hi-fi, music and professional recording-studio industry experts to provide ever-improved solutions at lower cost to the end-user. We strive to keep things simple: appropriate high resolution interconnects are designed to be dedicated to their respective interfaces in the audio or video chain. 'Speaker' cables employ high quality 'low-loss' dielectrics in order to facilitate the long runs necessary in modern esoteric hi-fi and multi-room or home cinema systems. Speaker cables are also made available in a variety of sizes, since the size and type can influence the depth, clarity and timbre of sound. Our loudSpeaker and interconnect cables, and Mains A.C. PowerChords will transmit, with least deletion, all the information and excitement contained in the original recording. Ecosse People are Music People-first and always! In hi-fi terms Ecosse can genuinely lay claim to being the only hi-fi company in the world drawn from a team of Audio Professionals allied with successful individuals from the fields of recording, promoting/managing and playing music! From our extensive and growing range of cables, we have interconnects, loudSpeaker and powerchord cables to match with your hardware and with your aspirations. It should be noted that each cable is specifically designed for its application and its termination chosen to maximise its performance. We use the highest quality materials not only in our cables but also in our unique plug terminations. So whether your requirements are for two-channel or for multi-channel, audio or visual; and whether your hardware is of modest cost or obscene, we have a cable to satisfy your needs. ...never before has cable conductor material of this purity and construction quality been available at these prices to the mainstream audio market-and with such quality terminations - our Monocrystal™ copper and silver RCA and XLR plugs are the best available price wise. Of course it helps that we have the FINEST 2-channel evaluation system OF ANY CABLE COMPANY ON THE PLANET! It lets us hear pretty much EVERYTHING that is going on! You can see it below. Ecosse Cables are inexpensive by comparison. How? We don't go in for fancy brochures, schmoozing journalists or expense accounts. We don't spend fortunes on magazine adverts and we don't spend ridiculous amounts on packaging - it's a wrapper for goodness sake. Our money goes into the cables! that they outperform our major competitors at similar price points. If a new Ecosse Cable does not meet these criteria it never sees the light of day. Here's a thought. Other cable manufactures and designers lay claim to 'prepare (you) to be amazed', or that their cables are 'derived from technology developed for the space industry or even that they 'changed the way people think about hi-fi cables'. But what do these people really know about the way 'music' (as opposed to 'hi-fi') sounds. You know, when they do their cable evaluations one presumes they set up their hi-fi systems as best they 'know' how, in order to test the 'accuracy' of their cables. But how do they know their music systems are accurate. What equipment are they using-is it 'sensitive' enough to the minutiae of sonic variances-will it resolve even the finest detail? Indeed, what experiences have they had in recording studios, or in the 'live' environment - how a cymbal, or a snare REALLY sounds when you hit it. The timbre of a vocal or the frequency range of a bass or electric/acoustic guitar; the sweep of a string, or the dynamics of an over strung piano. And while we're about it, the embouchure of Miles Davis on trumpet is about as good as it gets-but do these 'cable designers' have any idea what sound that truly makes. 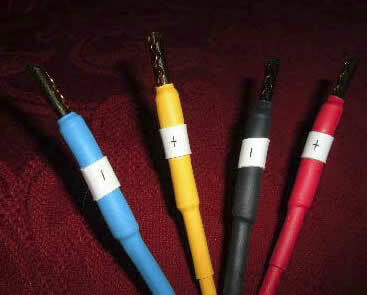 There is a direct correlation between cable design and sound quality. You want detail, resolution, clear bass, image, height , 3 dimensionality . You want accuracy of musical timbre and ambience. How do you get this? The choices of conductor and dielectric are vital. Different metals and the structure of the conductor itself play a vital part in the speed and accuracy of the sound. The choice of dielectric (insulation) is also vital, since a bad choice can increase the capacitance and induction between the +/- wiring which affects the high and low and frequencies. Inductance varies between cables - very simply high inductance is bad for audio. Cables need to have low resistance and capacitance to least attenuate the signal flowing thru the cable. Attenuation is a measure of the signals energy lost as it flows down the cable. That energy loss is reduced by having the conductors covered in a quality dielectric. All Ecosse Cables are very deliberately low resistance low capacitance hence low attenuation. In fact three things go into making a good cable - the conductor material the construction of the cable and the termination quality. 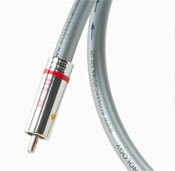 Even then there's no guarantee the musicality of the cable is up to scratch. That requires careful evaluation with a 'golden' pair of ears. Ears trained in music not HiFi. The terminations at the ends of cables are part of the transmission path and therefore vital to it. They must not impede the signal and this can be if particular significance in digital signals. Poor terminations on a digital cable change the so called characteristic impudence of the cable - so for example where a digital signal is set by the industry at 75ohms, change that and you change the sound. If a cable is inappropriately terminated you will compress the signal and change that characteristic impudence along with the other electrical attributes of the cable. Solution: at Ecosse we offer our unique gold and deep silver played non-compressing copper MACH1 RCA plugs on our premier/premier+ analogue, digital and video interconnects, and Monocrystal MACH2 and 3 RCA plugs in our more expensive audiophile/reference grade cables. Our RCAs don't compress the signal and at the same time they reject noise by the use of a faraday cage type mechanism. So why are connectors often the least thought of part of a cable. Go ask our competitors many of whom seem to forget they will be connecting a terminated cable to another connector in this case a socket and there needs to be optimum contact between the two without inducing capacitor or resistor characteristics. Terminations become oxidized over time and the connection can become 'bad' to the point where clearly audible distortion occurs. To reduce this concern Ecosse uses gold or deep silver plating on our COPPER ( not brass) plug terminations. Many of our competitors do not take this care and attention in their terminations-they still use tin/leaded solder and run the risk of galvanic corrosion. Extensive listening tests on the very best HiFi system in use by any cable company in the UK. Evaluations carried out by music people as opposed to HiFi hobbyist who have no experience of making producing or mixing music. But remembers no cable is perfect All cables delete musical information, Ecosse cables delete less information at similar price point to those cables of our competitors ...again, they just let the music through. Cable synergy-that's our byword! A quick glance at our synergy table tells you all you need to know about which cables best synergise with the one you own/are considering. Ecosse Reference Cables are designed to provide a family of sound and a straightforward interconnect upgrade path. With each interconnect upgrade unwanted 'noise' is reduced by progressively improved shielding which together with better quality termination ensures you will experience an ever - more accurate musical delivery. Our coaxial designed interconnects: both analogue audio and digital interconnects, have garnered a clutch of industry-led awards and 5-star reviews. This has allowed us to spend more (R&D) effort in designing 'balanced' audio interconnects - the higher spec cable preferred by discerning audiophiles. Our extensive research has resulted in the release of high quality/low low price (compared to our over priced over hyped and over here competitors) silver-plated or Monocrystal™ Silver balanced interconnects (since silver has a 10% gain in conductance compared to copper, a copper wire plated with silver will have less signal loss especially at longer lengths) these balanced/symmetrical cables all function magnificently well between CD/DVD and Amp or Processor. However, their balanced symmetrical configuration also assures audiophile quality interface between pre and power amps or as turntable leads. These symmetrical audio interconnects employ triple shielding, to offer the ultimate protection from spurious H.F. penetration 'The Legend' Interconnect improves even further upon this - offering four levels of interference-reducing screening. For the provision of incredibly inexpensive, but very high quality solution to the transmission of audio/digital/video signals Ecosse has researched and developed a cunningly unique range of cables. 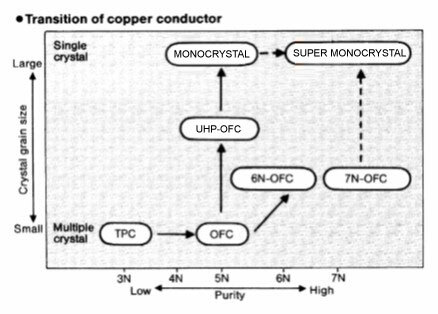 Here, our multi-award wining, universally acclaimed Monocrystal™ conductor is employed for the important 'going' conductor only (to keep the cost manageable) with OFC for the 'return' conductor. 'The Composer' Audio Interconnect works on this principle as does our S-Video interconnect, and our dedicated digital interconnect - 'The Producer'. For SPDIF digital connection use 'The Producer' or 'Executive' but for true audiophile quality you must audition 'The Director' or better still the TRULY ASTONISHING 'The Soundman Digital Interconnect. A marvellous world beater, that trounces the competition. Cables, being the longest part of a system, act as efficient antennas, picking up or radiating electrical noise. A cable's ability to minimise unwanted noise and to accurately transfer the frequencies inherent in the audio spectrum - 20Hz-20Khz+ - impact on the performance of your system. Truly then, cables are a vital component in today's modern audio and visual systems and it is imperative that they are given the utmost consideration. 1. The purity of the conductor material. 2. The preciseness of the cable construction. 3. The quality of the insulation material. The quality and purity of conductor material provide significant improvement in performance, enhanced resolution, clear bass, image height, depth and width. Ecosse is unique in offering vastly superior SuperMonocrystal™ and Monocrystal™ copper (and silver) products and multi-award winning Ultra High Purity Oxygen Free Copper. The selection of insulation material and construction methods influences the accuracy of musical timbre and ambience. Our interconnects and powerchords employ only the finest insulation materials of either low-density foamed Polyethylene or Teflon (PTFE). Ecosse cables are all double and sometimes triple shielded. For loudSpeaker cable we use only twisted pairs of multi-stranded or solidcore conductors sheathed in polypropylene as these two types most effectively reduce electrostatic capacitance, proximity effect (where the two conductors attract resulting in a greater resistance to the signal) and facilitates noise rejection (RFI). Bringing Monocrystal™ pure copper within the reach of most audiophiles is Ecosse's lasting legacy to the audio industry. For the first time (in decades) sensible/real world prices can obtain this sonically vastly superior conductor material: material which ensures, uniquely, an almost complete lack of 'grain-boundaries' in the signal transmission direction - impurities which would normally impede the delicate audio signals and result in attenuation and distortion. Here, a patented casting process (extrusion and annealing) is employed to produce a 'mono' or single crystal ultra-pure wire with significant advantages over other cables currently available. These other cables use ordinary copper or silver, which, no matter how few grains the manufacturer claims, have a grain barrier of oxygen and hydrogen. 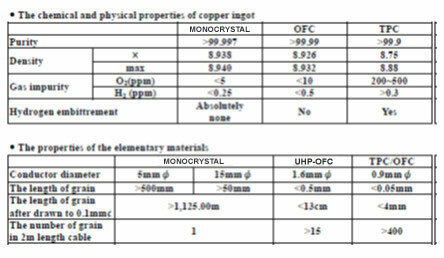 There are 9 perfect characteristics of this, by now, Monocrystal™ copper: Unidirectional, Free of Impurity, Flexibility, Fatigue-Resistance, Corrosive-Resistance, Low Electric Resistance, Non-crystal Boundaries, Rapid Transmissibility, Perfect in Structure. Continuous casting Monocrystal copper rod's metallographic structure has less than 3 'grains'; each single grain occupies over 75% of the total area. Compared with multi-crystal cast rod, the Monocrystal copper's tensile strength is increased by 10~20%, elongation rate is reduced by 50~80% and section shrinkage rate reduces by 200~300%. Compared with the more common continuous-cast copper rod our continuous cast Monocrystal copper's conductivity has been increased by between 2~10%. Ecosse proudly introduced the first real advance in copper wire casting and processing since the advent of single-crystal conductor material, with the world's ONLY Super-Monocrystal™ Cables - you might say we have taken the single-crystal process to the Nth (sic) degree! Here, the multistrand cable on offer is SMS2.4-of rope-lay construction where each conductor has 2 bundles of differing cross-sectional area - to further improve linearity and phase coherence. The dielectric we use is high-grade polypropylene and the conductors are wound together in a precise helix. The Super-Monocrystal™ Process (SMS): With continuous cast mono-crystal there are an absolute minimum of impurities in the grain boundary. Now, by heating and re-crystallising the metal, while absolutely maintaining its structure, and due to the physical stabilization of this ultra- pure material under stress-free conditions, we achieve an unsurpassed conductor of the delicate audio signal with quite exceptional linearity through the audio frequency band. N.B. Audiophiles please note that it is the purity of 'grain structure' (not to be confused with purity of copper or silver employed - often expressed as 99.99% or better - and merely signifying the purity of the copper ingot before smelting), which defines the major characteristics in the conductor's ability to transmit audiophile quality sound and video. For the record, Monocrystal™ is a minimum 5N's pure; SuperMonocrystal™ 7N! No metal is absolutely pure, and contamination, as well as the crystalline structure of copper, can have an often-dramatic effect on signal quality. Impurities within the copper, including oxygen, silver, iron, sulphur, antimony, aluminium and arsenic, coalesce at the grain surface, or boundary. This creates much higher impedance to the electron flow by essentially forcing the electrons to have to 'jump' those poorly conducting boundaries where grains touch. Reducing the impurity content and the number of grains per foot can make a wire a much more efficient conductor. Often our competitors use very impure 'tough pitch' copper, which has about 1500 crystals or grains in each foot. Current must cross these grain boundaries 1500 times in each foot of cable. OFC copper, which is about 99.999% pure, is still not perfect, but the higher purity reduces the number of grains per foot, and makes the sound audibly smoother. In Ecosse's further-refined OFC cables, the process of removing oxygen further removes much of these impurities. We have laid down a specification for a 'low-grain boundary' annealed oxygen free copper - so called because the molten copper is extruded and repeatedly drawn in an inert, oxygen-free environment, to greatly improve conductivity and reduce impurities. This we term Ultra Hi Purity Copper - of a magnitude of copper-purity surpassing that of our competitors. Our UHP-OFC is no less than 99.9997% pure! SHOCK: NOT ALL OFC IS THE SAME! Ecosse's OFC has but 40-parts per million grains versus normal Copper, which has about 235PPM grains. It is these grain boundaries which cause irritating distortions and have a deleterious effect on sound. This purification of our copper drastically reduces the formation of copper oxides substantially reducing the distortion caused by the grain boundaries. The sound of an UHP-OFC copper cable is smoother, cleaner, and more dynamic than the same design made with standard high purity copper. We believe the most natural sound is achieved by a combination of low inductance and low resistance. Inductance particularly influences high frequencies- low inductance minimises high end 'roll off' whereas low resistance ensures powerful bass and low mid-range. Attenuation of the signal is directly proportional to conductor resistance. Attenuation represents the amount of energy consumed as the signal transmits along the cable, and the lower the attenuation and therefore conductor resistance, the better. The forgoing is of paramount importance in the case of speaker cables where a high conductor resistance causes a decrease in the damping factor. The coil in a speaker generates it's own electromotive force which is fed back through a speaker cable and can, in extreme cases damage the power amplifier. D.C resistance is in direct proportion to the conductor's sectional area and the material employed, the greater the diameter and the purer the material, the lower is D.C resistance. When high frequencies are transmitted in A.C, a different set of values apply and conductor resistance increases due to skin effect, proximity effect and eddy current loss. In the audio spectrum-20Hz-20KHZ- the frequency characteristics of our Monocrystal™ and SuperMonocrystal™ cables remain relatively flat as the signal changes ie increases from DC to AC. Its these high frequencies that particularly influence (read on) timbre and ambience and contribute to a clean, smear free treble. Resistance in the speaker circuit is then probably the deciding factor in determining loudSpeaker performance. Rest assured, ALL Ecosse 'speaker' cables exhibit low resistance (which together with low inductance) resulting in a smooth, musically accurate performance. Ecosse speaker cables are never compromised in terms of the superiority of their construction. We use the exact same construction parameters throughout our range of UHP-OFC, Monocrystal™ or SuperMonocrystal™ loudSpeaker Cables - only the type of conductor material and the number of strands are different. We use multi-stranded and solidcore cables as only these two types- in a twisted pair configuration - effectively reduces electrostatic capacitance, proximity effect and noise. Here our delicate, stranded conductors are sheathed in low-dielectric polypropylene insulation and carefully bound in a concentric and tight lay, then twisted. With the higher spec Monocrystal™ MS2.3 and larger x-section/greater number of strands MS2.4 cables, the 2 conductors are further isolated from microphony (or external vibration) by a bed of cotton. Paper binds this rigid structure together. For SMS, the multistrands are again of rope-lay construction although now each conductor has 2 bundles of differing cross-sectional area, to further improve linearity and phase coherence. The dielectric is high-grade polypropylene and the conductors are wound together in a precise helix. Twisting of the conductors is necessary to overcome the 'proximity effect' that naturally occurs when 2 conductors are close to each other. Concentric Lay Stranded conductors involve multiple layers of wire laid out uniformly in a longitudinal direction with adjacent strands laid in opposite directions. These strands form a perfect circle, which stabilise the characteristic impedance, through the length of the cable, resulting in superior sound quality. With 'rope-lay' construction the wire is pleated allowing a large X-section of cable. This is vital as large X-sections (2.00sq mm +) provide a low DC resistance for the transmission of low frequency (bass) information, (together with extended stereo width, height and depth) and a greater surface area for the transmission of high frequency signals. (N.B above about 3.5sq mm, other factors become significant and the cable's ability to accurately transmit audio is compromised). Ecosse Reference also employ perfectly circular solidcore loudSpeaker cables as these are particularly effective at extending high frequencies - counteracting the deleterious consequences of 'skin-effect'; because AC high-frequency signal tends to travel along the periphery of the conductor and it is this skin-effect which now contributes to an increase in conductor resistance. This is particularly of importance in a biwire cable as it is these solidcore conductors that are connected to the HF cross-over to sweeten the treble and increase the overall signal bandwidth. Our solidcore precision drawn wire is coated in a polypropylene extrusion of very close tolerance uniform thickness and density along its length. The positive and negative conductors are twisted with cotton bundles and wrapped in paper fibre tape before being bonded in soft PVC. This structure results in a low microphony, self-damping cable. Our CS2.15 and MS2.15 loudSpeaker cables share this design. US2 pure Monocrystal™ Silver 'speaker' cables offer even greater advantages in clarity, tonal purity and timbral accuracy, which are the greater strengths of the solidcore cables. The US2 consists of 6 quadruple clad conductors offering an uncanny sense of ambience and soundstage, with greater instrument placement and resolution; vocals are clearer with real presence and natural breath tones; glare and edginess give way to a sweeter and more detailed treble. The bass does not suffer either as the optimum wire diameter has minimal DC resistance affording a tight, extended bottom end. High frequency signals tend to occupy the periphery of the conductor, due to their failure to enter the conductor centre. These frequencies do not use the entire section of the wire and consequently meet increased resistance. The occupational area for a high frequency signal is greater with a solid conductor, therefore resistance is reduced and delivery of high frequency information is improved. Twisting the conductors achieves a cancelling effect and a uniform low resistance, low attenuation current flow. All Ecosse cables employ twisted pair design Additionally, twisting also reduces R.F.I./EMI induced 'noise'. (c.f. attenuation = the amount of energy consumed as the signal transmits along the cable). A loudspeaker consists of two drive units. - a high-frequency (HF) unit (tweeter), and a low frequency (LF) unit (woofer) they employ a "cross-over network" to direct low signal frequencies to the woofer, and high frequencies to the tweeter. This set up enables the loudspeaker to be bi-wired. In a biwire configuration 2 pairs of speaker cables are employed in order to ensure that the signals for the tweeter and woofer are sent by separate routes. Here, the cables feeding the higher frequencies (H.F.) are not affected by electromagnetic interference from the low frequency signals (L.F.), which are carried in separate conductors. We recommend ES2.23, MS2.3 and MS2.4 or SMS2.4 multi-strand for L.F. and solidcore CS2.15 or MS2.15 for H.F. extension. Using a biwiring configuration the net effect is a reduction in impedance seen by the amplifier; load is reduced and frequency response increased. The upshot of which is a genuine extension of soundstage and dynamics. The audio signal as it moves from low to high frequencies down the conductor moves from a DC signal to an AC signal. The DC signal down the centre meets with lower resistance in a larger conductor, so big conductors give more bass. The optimum conductor size for the lowest resistance to the bass signal is about 3.0 sq mm (can be larger for our new SuperMonocrystal™ cables). A solid conductor has a greater occupation area for the high frequency signal (A.C.) that occupies only a few microns into the peripheral surface of the conductor - referred to as 'skin effect'. Solidcore cables such as the CS2.15 and MS2.15 are particularly effective at extending high frequencies - counteracting the deleterious consequences of 'skin-effect'. The part of the signal to which I refer is > 20kHz. That's just beyond human hearing but it's these frequencies which influence timbre and ambience and give smear free treble by intermodulating with lower frequencies. ‘2 end’ (or ‘4 end’ in 4>4) connects to amp, ‘4 end’ connects to speaker. 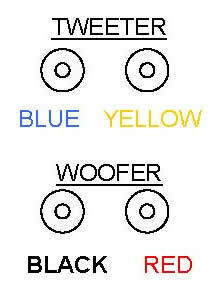 This basic diagram to the right shows you the cable’s colour configuration as you look at the back of your speaker (your speaker will be marked with positive and negative or colour coded, follow the code marked on your speaker if it does not match the standard shown). The solid cores on our biwires are the blue and yellow ends, going to the tweeters with the yellow end on the right side as you look at the back of your speaker. The stranded cores are the red and black ends, going to the woofers with the red on the right hand side. The red end goes into the positive socket; the black goes into the negative socket. If you have purchased 4>4 cabling, then use the diagram above left to hook up your cable. The Ecosse Interconnect Cable Range consists of either coaxial or 'balanced' conductors of rope-lay multi stranded topology - insulated then twisted (to reject unwanted noise) and surrounded in a soft PVC sheath. These cables are composed of three main elements: the signal conductors, the dielectric, and the terminations. (see HI-FI/ AV INTERCONNECTS TERMINATION). The conductors carry the delicate audio signal; the dielectric is an insulating material between and around the conductors to reduce signal loss; and the terminations provide the proper connection to audio equipment. They use, for the most, Foamed Polyethylene insulation- as this material exhibits least energy-store loss. Yes even better than Teflon! With balanced - or symmetrical - cables the two paths for the signal are electrically identical and are totally divorced for low noise. They are screened but the screen is connected at one end only to collect and drain R.F.I/EMI 'noise' (usually the 'source' end). These symmetrical cables, where the conductors are positioned side-by-side, require a twisted design configuration. Here, conductor attraction ('proximity effect') is neutralised resulting in uniform, low resistance, current flow. The unbalanced type has a 'going' and 'returning' line which are not equivalent in terms of construction or electrical performance. These are 'coaxial' cables, where the shield is conductive and is employed for the return path. In general the resistance of the shield is lower than that of the conductor - hence unbalanced! The grounding wire of a coaxial cable is an important design feature as it is this wire that completes the circuit protecting the conductor and minimising signal leakage and also shielding the assembly from EMI 'noise'. The higher the percentage of braid, the less 'leakage' occurs. That's why Ecosse coaxial interconnects use no less than a 95% braiding - and in some cases we employ double braiding to ensure maximum coverage. This increases the random closing of gaps and greatly reduces signal leakage, as it also improves the ground, thus preventing current flow. Current flow in a ground can be detrimental to the delicate signal. In each cable a conductive braided shield protects the signal conductor from electrostatically induced noise and its 2nd,double screen, rejects magnetically induced noise - ensuring no less than 95% rejection of R.F.I. (radio frequency interference). Our interconnects employ only the finest insulation materials of either low-density foamed Polyethylene (LDPE ) - the foaming reduces the 'dielectric constant' thereby stabilising the frequency characteristics of the cable) or Teflon (PTFE). These dielectric insulators exhibit superior mechanical properties such as isolation to vibration and maximise signal velocity. Ecosse Interconnects are all double, triple and sometimes quad shielded. The first shield will protect the conductor from electrostatically induced noise (EMI) the second shield rejects R.F.I. Since most commonly used 4mm banana plugs are made from gold plated brass-brass being an incredibly poor conductor- and employ a spring, which gives minimal contact area, we instead recommend our superior 4mm hi-contact hollow z/x bananas. It should be noted that these z/x banana plugs might also be used in most Cyrus and Naim set-ups - where BFA plugs are required. As a genuine audiophile upgrade we offer these z/x banana plugs in our award-winning Monocrystal copper material-for the very best banana termination available. Our Monocrystal logo z/x bananas are offered as standard as a FREE TERMINATION UPGRADE on our MS2.4, SMS2.4 and US2 loudspeaker cables. Solder wise we employ Supersolder™ -our new ultra high purity silver and tin alloy solid wire-used in conjunction with our unique, passive organic flux. Together these ensure a joint with ultra low chemical contaminants and very high strength. Our preferred termination however is in the use of spades - using a crimping method- wherein our 'TightSeal™- OFC or Monocrystal™ Spades can be securely attached to a screw terminal or a binding post thereby providing a substantial airtight seal with no differing material barrier to the delicate signal. Our Monocrystal™ types come as an upgrade on any of our cables or pre-terminated on our audiophile reference SMS and Ultima US2 cables. Here, a very high-pressure crimping device creates a seamless joint twixt cable and plug. This maximises contact area to the point where air is excluded from the join, thus forming a "cold weld" between two metals, ensuring reduced contact resistance for faster smoother signal transmission. The only problem here is the size. The max. binding post diameter for our OFC spades is 6-7mm: for larger diameter (up to 9.00mm) binding posts we offer 1mm thick nickel-plated brass spade terminations. Our Monocrystal™ spades will fit 7-7.5mm binding posts. The terminations at the end of interconnects, RCA BNC AND XLR, form a vital part of the transmission path. High-quality terminations are essential to a quality interconnect. Ecosse are the only company in the worldoffering non-compressing copper RCA plugs on our inexpensive premier/premier+ analogue, digital and video interconnect, together with grain-free ultra-pure Monocrystal™ contact pinned plugs (RCA and XLR) in our more expensive audiophile/reference grade cables. No interconnect plug should grip a cable with a collet or grub screw action - as this type of plug (used by most-if not all-of our competitors) compresses the signal. Audiophiles should note that collet-action or grub screw plugs can sometimes compress the cable impedance as low as 25 Ohms, resulting in signal reflections, which can be disastrous-particularly for digital and video signals. Furthermore, Ecosse uses superior gold or silver plating on our plug terminations. Many of our competitors do not take this care and attention to detail in their terminations-they use tin/leaded solder which run the risk of galvanic corrosion, becoming oxidized over time and the connection become 'bad' to the point where clearly audible distortion occurs. We want a large surface contact between the interconnect's plug and the component's jack, and high contact pressure between them. Ecosse plug terminations are soldered to the conductor using Supersolder™, our zero-tin (tin is high in impurities which increase conductor resistance), ultra-high conductivity solder. Supersolder™ is our ultra high purity lead-free 5% silver and tin alloy solid wire- used in conjunction with our unique, passive organic flux. Together these ensure a joint with ultra low chemical contaminants and very high strength. To maintain the quality of the all-important interface between interconnect and component and compatibility between wire material and plug, Ecosse developed the MACH1 RCA plug(above). For use with our Premier and Premier+ Grade cables, this high quality RCA plug boasts the same design as our Audiophile-spec Mach2 RCA (above)and differs only in the material used for the construction of the signal centre pin and return contacts (shells* see below). To maintain continuity and optimum conductivity, these contact points are made from OFC copper - same as the conductor wire itself-don't be fooled by inferior yet similar-looking impure brass plugs as used by some of our competitors, these are cheap and nasty! The RCA plug casing is also of significance. It is precision machined from highest quality copper alloy and is deep-plated. This thick casing offers further shielding - effectively a second 'Faraday Cage' - and reduces the ingress and radiation of EMI, ESI and RFI 'noise' even further, to virtually zero. The interface of shells* (see below) and casing is one of high mechanical impedance, dissipating energy and rendering microphonic effects negligible. The full assembly represents Ecosse's Premier Plus Grade RCA termination for smaller diameter cables and we believe the Ecosse MACH1 RCA to be the best available price wise, electrically, mechanically and aesthetically - anywhere! They provide a terminal to which the return/screen conductors can be firmly crimped and Super-soldered. The interface between the wire and the component is an important one, and a poor connection can result in mediocre sound. For this reason, we have developed RCA connectors using our patented Monocrystal™ (single crystal) high purity copper for the contact pins to provide the best transmission of detail in the signal. In addition, the tolerance of the plugs has been machined by computer controlled high precision lathes to quality standard ISO9000 and ISO9002. This aerospace level of precision is not over-kill, since a "gas tight" connection lowers contact resistance and reduces the corrosion from air-borne contaminants, allowing better sound over long time periods. All joints are mechanically compressed before solder is applied to ensure a strong bond, which will endure a lot of movement without breaking. The full assembly represents Ecosse's Audiophile Grade RCA termination for smaller diameter cables and we believe the Ecosse MACH2 RCA to be the best available in this price range, electrically, mechanically and aesthetically - anywhere! Our most sophisticated RCA plug assembly -the awesome MACH3 frighteningly expensive constant-impedance (non-compressing) RCA plugs. Ecosse's ultimate Audiophile Reference Grade connectors use Monocrystal™ (single-crystal) ultra pure copper to provide the very best transmission of every detail in the delicate audio signal. The interface between the wire and the component - particularly in higher-end systems - is an important one, and a poor connection can result in compromised sound. The terminations of a cable are critical. We keep a set of tools and solder station purely for Monocrystal™ to avoid cross-contamination. The wire and plug pins are deoxidised just prior to soldering; the solder is Pb-free and is a 95% Sn/5% Ag alloy with resin core and a pre-heat with the gun reduces the soldering time to avoid the wire heating up too much and recrystallization of the structure. The XLR plugs are direct Cu-plated Monocrystal™ Cu the dielectric is polypropylene (less sonic signature than PTFE) and the body is non-ferrous. These factors reduce jitter (in a digital cable), signal-loss and reflections and play an important role in the transmission of maximum information. It is extremely unlikely that the other cables have been assembled taking these parameters into account. The roughness in the treble and information loss is symptoms of increased jitter, although many other factors in the analog domain can cause similar effects. Here, the shield/shells (see above) grip the cable firmly but without compressing the cable, ensuring that the crucial characteristic impedance is maintained. A heavy, silver-plated brass body, with twin high tensile fixing screws, clamps this double-shielded assembly uniformly and without stress. All joints are mechanically compressed before Supersolder™ is applied to ensure a strong, durable, ultra low impedance bond. The joint is then sealed with Polyurethane lacquer to protect the joint from degrading environmental contaminants. The plug casing, itself comprising of 3 parts, is precision machined from highest quality copper alloy and is deep-plated with tarnish-resistant silver. This thick casing offers further shielding - effectively a second Faraday Cage - reduces the ingress and radiation of EMI, ESI and RFI 'noise' even further, to virtually zero. The interface of shells* (see above) and casing is one of high mechanical impedance, dissipating energy and rendering microphonic effects negligible. The full assembly represents Ecosse's "state of the art" RCA termination for large diameter cables. The Ecosse MACH3 Ultima RCA is the very best plug available electrically, mechanically and aesthetically - it's the best we've ever encountered! The inner body of the plug consists of two symmetrical shells (figure 1-3). The ground connection sleeve is integral with these shells and is divided into four parts or ‘fingers’. When the plug is inserted into the socket, the edges of the ground connection fingers are forced outward by the body of the socket, which in turn, results in the edges of two of the ground connection fingers being turned inwards (the fingers being designed to permit this rotation) and this forms 8 longitudinal, pressure wiping contacts along the outside of the socket as the plug is inserted. This means that the plug will always break any oxide film present on the socket when the plug is inserted, and the high contact pressure will help to prevent the oxide from re-forming, leading to a contact that is superior to that achieved by conventionally designed plugs. The method of connecting the cable to the plug is by super heated lead free solder. As the inner body shells almost completely enclose the centre conductor, they offer a very effective screen against noise. As the length of the centre conductor between where it emerges from the end of the cable and where it joins the centre pin is very small, the variations in characteristic impedance within the plug are reduced, thereby improving the efficiency of this plug at radio frequencies. The efficiency of the plug is further improved in this respect by the use of foam polypropylene for the centre insulator, as this has a very low dielectric loss. The inner body shells are held firmly and securely together by the outer body in figure 1/3. The simple and sturdy design of this plug along with the use of high quality materials eliminates problems such as cable short circuits, cable disconnections, and deterioration of insulation with time - and enables it to withstand considerable physical abuse. The cable clamp in figure 1/3 puts even pressure all the way around the cable, eliminating the changes in characteristic impedance caused by screw clamps. The protuberances on the clamp fingers grip the cable securely preventing any movement cable once clamped. The quality of any digital cable is ultimately defined by its conductor material, the dielectric used and the electrical properties it exhibits in terms of inductance, impedance, and rejection of the environment-eg EMI, RFI noise. It is of fundamental importance for the transmission of high frequency and pulse signals such as those from a digital (or video source), that the transmitted signals match the characteristic impedance of the cable. The correct type of cable is an asymmetrical, or co-axial, typically of 75 Ohm impedance. If an alternative is used, then the signal will be reflected - 'jittered' - and the square wave signal form will be distorted, causing a roll off in high frequency information. There are many ways that so -called 'jitter' can affect the final digital to analog conversion at the DAC; Jitter on the transmitted signal can bleed or feed through the input receiver, and affect the DAC. Thankfully this really only affects sound of the signal going directly to a DAC. If you're running into a computer, the computer is effectively going to be reclocking everything. Same applies to CD-recorders, DAT tapes and similar devices. Even modern DACs have typically a small buffer and reclocking circuitry, so the jitter is not such a big problem nowadays. Impedance mismatch can occur when a cable with internal impedance less than 75-ohm is connected to a true 75-ohm load, such as a quality A/V receiver or DVD player. In this situation, some of the frequencies that make up the signal will be reflected back to the source. Since the source is a 75-ohm unit, this reflected signal is sent directly back to it (A/V receiver or DVD player) creating a delay effect at certain frequencies. This delay, for example, can show up as a ghost in the picture. Multiple ghosts resulting from multiple frequency reflections can look like ringing around the original image. These reflections can also cause partial signal cancellations at various frequencies corresponding to a partial signal loss resulting in a loss of picture detail or color for video and constriction of particularly upper frequencies for audio (jitter). Maintenance of the cable impedance from end to end is an imperative in video signals. At Ecosse our RCA or BNC connectors maintain the electrical integrity of the cable-which, as stated above, is rated at 75ohms. With each succeeding cable in our range you will notice that the quality of the plug improves so that in our 'Executive Digital' cable we use our superlative constant impedance MACH1 RCA terminations. For the Audiophile 'Director' and 'Soundman' Cables these plugs are further upgraded to the beyond-the -competition Monocrystal™ MACH2 and MACH3 phono plugs and Of course BNC plugs by their very nature are designed to be rated at 75ohms so you can be certain that all Ecosse BNC terminations adhere to this specific design principle. Beware: There is a new cable hitting the market that doesn't use conventional RCA connectors. It actually has a 'Bullet Connector' derived for audio cables. Based on the RCA connector's geometry its design cannot produce anything close to a 75-Ohm termination and therefore, can cause impedance mismatching resulting in reflections and signal. There is a specific relation between the diameter of the conductor used and the diameter of its surrounding dielectric that must be maintained to ensure a true 75-ohm cable- and thus delivery of lifelike digital signals used in high-end/audiovisual system. The equation is also dependent on the dielectric characteristics of the material. The best dielectric is air (not practical) followed by Teflon and/or Foamed Polyethylene (nitrogen, air…), Polyethylene, Polypropylene, Nylon and least of all PVC- a material NEVER used by Ecosse as a dielectric. Impedance is a measure of the ability of an AC network to impede the flow of charge or current through a network. A high cable inductance causes loss of signal strength towards the high end of the audible range (also known as roll-off). It also causes frequency dependent phase-shifting which disturbs true stereo imaging. EMI exists within the range of video signal frequencies so it is possible for 'stray' signals from EMI to find their way into the cable and therefore, create a false signal or internal noise within the cable. Our Ecosse digital/video cables are sufficiently shielded to minimize EMI from entering into the cable including the use of braided grounding shields and non-magnetic foils. The signal on the digital output of a CD-player looks like almost perfect sine wave, lose/alter that wave and you interfere with the delicate signal. It can carry a stereo pair of channels with a sampling rate of up to 96 Ksps and with a sample precision of up to 24 bits. The S/PDIF output from CD players fits inside this envelope, being only 16 bits per sample at 44.1 Ksps. RCA/phono sockets are normally used but for maintenance of the square-wave we recommend true-75-ohm rated BNC plugs (if permissible). At Ecosse we offer £ for £ the finest AES/EBU digital cable on the market today-our all-Monocrystal™ Silver individually wound and hand-made 'In the Beginning' Interconnect! Its a delicate totally lovingly hand-built cable, takes many hours to perfect and ONLY available direct from us and made to specific order. We recommend pairing this with only the very finest of Audiophile Systems. Its not cheap. For a price /info email us here. The two formats are compatible with each other for audio, but differing connectors are required. Reference quality equipment will use balanced XLR connectors to carry S/PDIF over differential pair cable (as commonly used for low impedance recording studio microphones.) However, it is important not to use low-microphony cable for digital interconnections since it has very poor high frequency transmission capabilities. A third physical media often used is plastic optic fibre. Optical Fibre has the advantage that, since it is non-conducting, earth-loops cannot be generated and the fibre link is immune to hum and noise pickup. That's the theory-in practice however optical fibre components can lead to increased jitter generation in the process of separating clock from data. This can cause a measurable degradation of the conversion back to analogue format. The primary purpose of a component video cable is to carry the pulsed square wave high frequency AC video signals from source to TV/plasma/projector. Ecosse component cables ensure this transfer is carried out with the minimum of interference, signal loss, and signal degradation. With each cable upgrade 'noise' is progressively reduced resulting in an increasingly improved picture at your monitor end. At the seriously high frequencies involved in video signal transfer, there are a number of factors that can create problems. 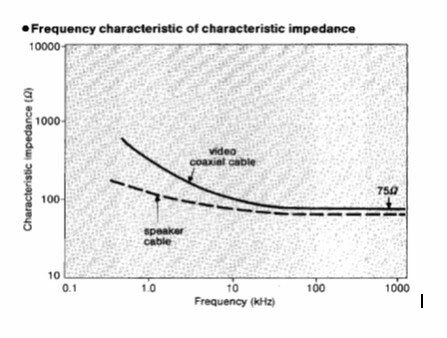 As above: It is imperative that for video (and digital) signals the characteristic impedance of the cable matches the impedance of the component interface -which is 75ohms. The characteristic impedance of a coaxial cable is determined by the size of the conductor and the quality-in terms of minimising energy loss-and diameter of the dielectric material. You can be certain that our component video devices are designed to ensure matched impedance. Impedance mismatch can occur when a cable with internal impedance less than 75-ohm is connected to a true 75-ohm load, such as a quality A/V receiver or DVD player. In this situation, some of the frequencies that make up the signal will be reflected back to the source. Since the source is a 75-ohm unit, this reflected signal is sent directly back to it (A/V receiver or DVD player) creating a delay effect at certain frequencies. This delay, for example, can show up as a ghost in the picture. Multiple ghosts resulting from multiple frequency reflections can look like ringing around the original image. These reflections can also cause partial signal cancellations at various frequencies corresponding to a partial signal loss resulting in a loss of picture detail or color. In a standard audio cable for example, the internal impedances are between just 50 and 60-ohms. Since they are designed to carry low frequencies (20Hz to 20 kHz), audio cables have different impedances from component video cables. If audio cables are used in place of component video cables this lower impedance can result in degrading signal reflection. Problems can occur during soldering: these include, if great care is not taken during the delicate soldering process, melting of the dielectric, excessive solder, incomplete solder joints etc. All Ecosse video (and digital) cables are specifically designed for their respective interfaces. Thus we will never use an analog audio cable to transfer these significantly higher frequency video (about 10MHz) signals. All Ecosse cables employ the finest insulation materials of minimum dielectric loss, thus ensuring accuracy of musical timbre and ambience. Quality insulation will also reduce E.M.I, R.F.I. and 'proximity effect'. We use either polyethylene or Teflon (PTFE- polytetrafluoride epoxy) dielectric as these insulators exhibit superior mechanical properties (such as isolation to vibration) to maximise the signal and its transmission velocity. In certain of our cables these two dielectrics are combined within the cable's topology. Air-Foaming reduces the dielectric constant and the dielectric loss by introducing air, thereby stabilising the frequency characteristics of the cable. Ecosse interconnect conductors employ (foamed) Polyethylene Dielectric or Teflon (PTFE) Insulation as these insulators exhibit superior mechanical properties (such as isolation to vibration) to maximise the signal and its transmission velocity. Our loudSpeaker cables are sheathed in a polypropylene insulator except where the more-expensive Monocrystal™ Silver loudSpeaker Cables are concerned. Here we add our patented PTFE (polytetrafluoride epoxy) ultra-low D.C. air-space dielectrics together with Cu-foil and a nylon or polyester braiding.